I have always loved Siamese cats. Their elegance and beauty is outstanding! I had an urge to get one recently and I found my little girl. Her mother is a gorgeous seal point and her daddy is a beautiful lilac point. First I met Panda, the devoted and loving mother. She came over to me straight away and started talking to me in her classic Siamese meow. I instantly fell in love with her. Then I saw the babies. Well, my heart melted! There were four little balls of fluff, playing with everything, and exploring too. I sat down on the floor and carefully petted one with my index finger. The little girl came right over to me and started licking my fingers. I knew then that she chose me to be her forever mom and I felt blessed. I decided to take her home. After getting a bunch of kitten supplies I went to pick her up. She saw me and literally jumped into my arms! We had bonded instantly and I decided to call her Anna. Boy is Anna a little cuddler! She hasn't left my side yet. I just got her yet we have bonded so closely. My precious little girl is now taking over my house room by room, the other cats are beside themselves. So far, Anna has met Mitsou, my eleven-year-old Calico. Mitsou is the gentlest cat I have ever known. She has no problem with little Anna, watching her curiously. The other two cats, Autumn and Timmie (two orange tabbies) are slowly adjusting. I am looking forward to spending a long time with my Anna and hope our bond forever remains strong. 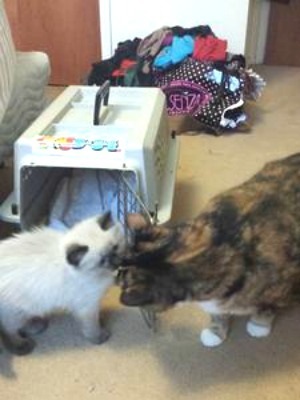 Thank you Sarah, for your photo and story about your new kitten Anna. I hope by now she's settled in well with the other cats and that she has a long and happy life with you all. Is she a blue point, or a lilac? It's a little difficult to tell from the photo, but she's certainly very pretty and a cutie for sure!